Drinking a rose flavoured spirit liqueur seems very appropriate today, especially on the Day Of Love. Of course it’s Valentine’s Day and these are the kind of roses, us here at OnIn.London prefer. We were recently sent a bottle of Lanique to review. It’s been enjoyed for over 200 years by European aristocracy and made from an original recipe that uses thousands of hand-picked rose petals. We’ve been told that Lanique was first enjoyed in the Kingdom of Prussia and Austria where it was much favoured and enjoyed by the elite at celebrations and grand balls, sipping it neat in small tasting cups. Legend has it Lanique was created by a Princess who owned a distillery close to her castle in what is now modern day Poland. Pretty romantic if you ask me. The spirit smells divine and the vibrant and bold pink colour, make sure the bottle look great in our liquor cabinet. I love the look of the bottle as well and when I had friends over this weekend, they were intrigued by the spirit. I love Turkish Delight, so this is the first thing I thought of as the liquid touched my lips. It was very sweet though. The rose flavoured was overpowering and tasted natural rather than artificial as some rose flavoured drinks can. 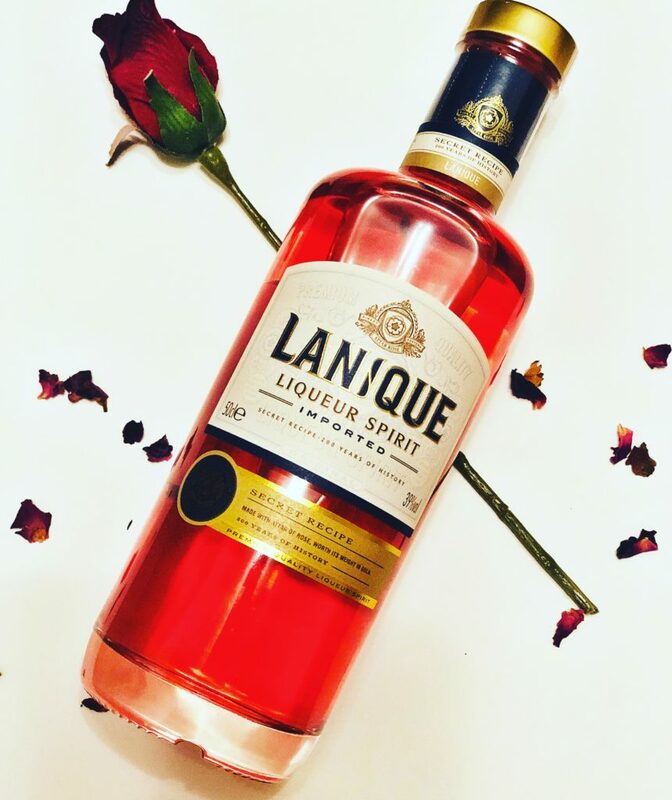 There’s a couple of ways to drink Lanique and the brand recommend trying it with tonic water as an alternative to Gin and Tonic, Lanique Rose and Tonic, as a champagne cocktail, Lanique Rose Royale or in a twist on a classic cocktail such as Lanique Rose Negroni or Lanique Rose Mojito. Visit their website for more cocktail recipes! We tried the Lanique cocktail with 50 ml Lanique, 12.5 ml fresh lime juice, crushed ice and 1/4 fresh lime. It was easy to make as you just combine and pour Lanique and fresh lime juice over lots of crushed ice and a quarter of a lime. This was very easy to make and even more easy to drink. A very dangerous drink for sure as it was that delightful- I almost forgot I wasn’t drinking alcohol. Get this for your loved one today instead of the usual roses! You won’t regret it! 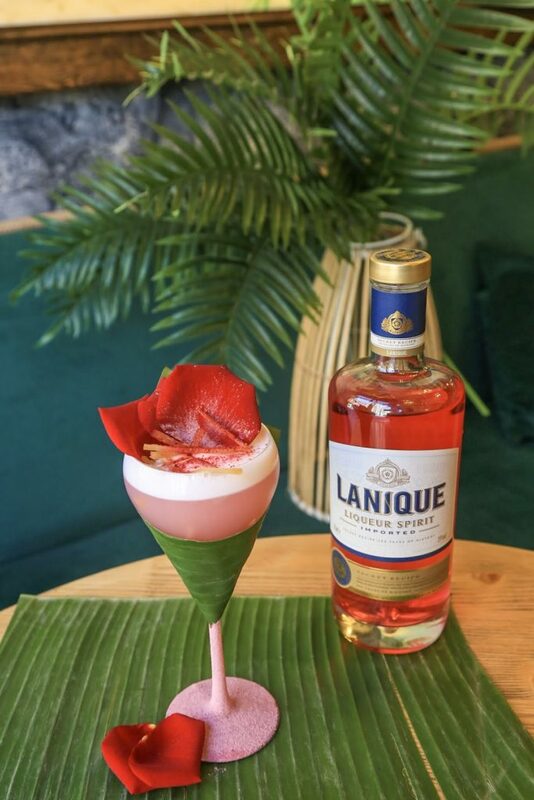 Lanique Rose Spirit has also teamed up with one of the best tropical cocktail bars in London, Laki Kane to create their own exotic Valentine cocktail – The Rose. If you are looking for a tiki bar experience with a romantic twist why not enjoy this bespoke love potion which combines Lanique with hibiscus syrup, Laki Kane rum, lime juice and egg white.